Earlier we brought to you Marshmallow update for several other Samsung Galaxy S6 Edge Plus variants including Korean, G928F, G928C, Sprint and much more. This time, the G928G is receiving the update in South Asia and some parts of South America. S6 Edge+ devices in countries like India, Argentina, Colombia, Panama, Sri Lanka, etc. are already running on Android 6.0.1 Marshmallow and the manufacturer is now releasing it on several devices. This is a jump from the Lollipop 5.1.1 to 6.0.1 and packs all the Marshmallow goodies. Other premium devices like Samsung Galaxy S6, S6 Edge or Plus and Note 5 are also being updated worldwide by Samsung. Now you can either wait for the OTA (over-the-air) update to hit your S6 Edge+ G928G, or download it manually from the download section below. The firmware build number G928GDDU2BPC4 brings Android version 6.0.1 and comes with several bug fixes, performance improvements and security enhancements. Firmware Details: Model SM-G928G, Model name Galaxy S6 edge+, Country Sri Lanka, Version Android 6.0.1, PDA G928GDDU2BPC4, CSC G928GODD2BPC5. you may also be interested in root access on Marshmallow. Warning: Although going through this procedure should not cause harm or any damage to your device, it remains an unofficial process and you should be cautious about it. Reader’s discretion is advised. 1. Verify your device for compatibility. The listed firmware is compatible with Samsung Galaxy S5 and several of its variants only. For other variants, check out the tool from this page. 3. Make sure you have latest device drivers setup on your PC for a better connection. Get it from the download section official from the manufacturer. Step 1: Download the listed firmware for your for your Galaxy device. Extract the zip file to get the firmware with .tar or .tar.md5 extension and place at a location where you can easily locate it in your PC. Step 2: Now boot your device into Download/Odin Mode. To do so, turn off your device completely and then press and hold Power button + Volume Down + Home keys for a few seconds. If you see a warning sign press Volume up/ Volume down to get the Odin screen. Step 3: If you already have Odin software on your PC then simply run the Odin3_3.10.7.exe file. If not, then download the Odin3.zip file from the download section and extract it. Run Odin software as administrator. Step 4: While your device is still in the Odin Mode, connect your device to your PC using a USB cable. Step 5: After a successful connection, the ID: COM in the Odin should turn Blue and an Added!! message should be displayed in the Log tab. In case your device doesn’t show up in Odin, then you can troubleshoot it with the steps given at the end of the tutorial. Step 7: Take care that only Auto Reboot and F.Reset Time are selected in the Options tab. Do not check Re-Partition. Step 8: Once done, verify everything and proceed with installation by selecting Start button. Step 9: When you get a PASS! message in the Log tab on your Odin software, that means firmware has successfully been installed and the device will restart itself. If not then reboot manually. When you see the boot animation, you can enjoy your new firmware. Be patient as first boot may take a while. However, if the system doesn’t boot up for a long time, then go through the following. How to Fix Bootloop on Samsung Galaxy Device? If you come across boot loop or your Samsung Galaxy device is stuck at the boot logo then factory reset your device from the recovery. To do so, turn of your device (also remove the battery if applicable and put it back again) and reboot into recovery mode by press and holding Power + Volume down + Home keys for a few seconds. From the Recovery, select Wipe Data / Factory Reset. Confirm the action and reboot once done. Your device should now boot up. How to Troubleshoot Connectivity problem on Samsung Galaxy Device? If your device doesn’t show up in the Odin software, then turn off USB Debugging and turn it on again and Reboot. 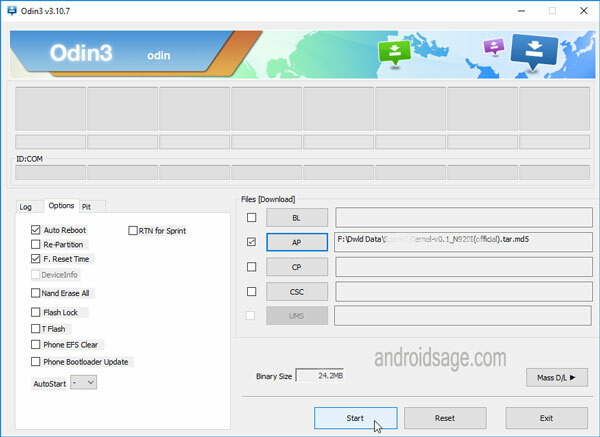 You can also reinstall the Samsung USB Drivers or try changing the USB cable and connection ports from device manager. Follow, Like and share us on social media. For any help or queries, comment down below.